A native of Pierson, FL, Larry “Chipper” Jones was a standout pitcher and shortstop at Bolles High School in Jacksonville where he led his team to a state championship and was named a First-Team All-State and All-America selection. 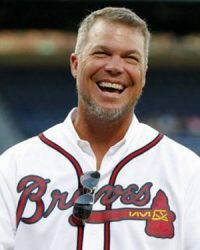 He would go on to become the first-pick overall by the Atlanta Braves in the 1990 Free Agent Draft. Quickly advancing to the Major Leagues, Jones would go on to a stellar 19-year career where he would compile a .303 career batting average with 428 home runs and 1,623 runs batted in. Jones would earn eight All-Star berths, two Silver Slugger Awards, the 2008 batting title, and the 1999 National League MVP Award. His #10 was retired by the Atlanta Braves in 2013.